Jody Christopherson in AMP. Photo by Hunter Canning. BOTTOM LINE: Fusing the tales of two unconventional women, AMP is a fierce burst of inspiration and madness. As both science and metaphysics attest, the life force within us is like electricity: raw, intrinsic, and equally capable of illumination or destruction. With intellectual or creative endeavors, this distinction becomes more acute: unchanneled or unfocused, such energy can breed chaos. Inspired by early electro-medical research, the accounts of mental patients, and the writings of Mary Shelley, Jody Christopherson’s solo show AMP treads this continuum, using electricity as a metaphor for mankind’s genius and monstrosity. 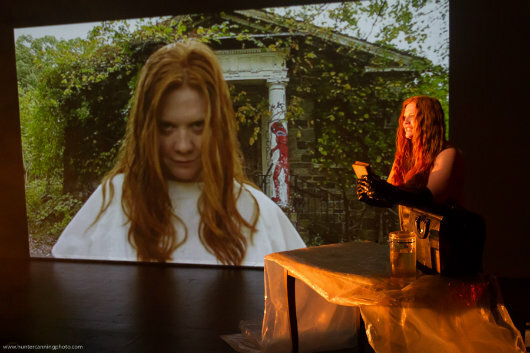 Jumping between live-action performance and projected film, AMP grounds its concept in the narratives of two women, each played by Christopherson: renowned author Mary Shelley and Anna, a volatile 1950s-era cellist. As Shelley, Christopherson transforms the stage into writer’s study and medical theatre, depicting the artistic, social, and personal climate in which her novel Frankenstein was born. The daughter of utilitarian philosopher William Godwin and groundbreaking feminist Mary Wollstonecraft, Shelley recalls her early experiences with progressive education and scientific inquiry, particularly her interest in the work of Luigi Galvani, an eighteenth-century scientist whose “animal electricity” experiments with reanimated frog corpses paved the way for modern bioelectrics. Haunted by her late mother’s legacy and her stepmother’s stifling control, the young Mary elopes with poet and family colleague Percy Bysse Shelley. Following Mary’s miscarriage and a lengthy European journey, the Shelleys find themselves on retreat in a Swiss villa with the eccentric poet Lord Byron. One fateful, stormy night, Byron’s challenge to write a short horror story inspires Mary to channel her experiences into creating the novel Frankenstein, a tale now synonymous with terror and megalomania. Structured as a series of filmed medical interviews, Anna’s onscreen story paints an equally jarring portrait of ambition and cruelty as she recounts the events surrounding her psychiatric incarceration. A South Bostonian fisherman’s daughter, Anna found transcendence in her passionate cello playing but remained unrecognized, her talent discouraged by her high-school orchestra leader and eclipsed by that of her mediocre male peers. In 1952, the Boston Symphony Orchestra’s first gender-blind auditions promised Anna a life-changing opportunity, but the bias dominating this purportedly equal practice led to her subsequent psychotic break. Viewed as a threat to herself and others, Anna becomes a living experiment as asylum doctors scrutinize her condition and treat it with crude electroshock therapy. Though time and circumstance divide Mary and Anna, their similarities are evident, each woman misunderstood by her society and pushed dangerously close to the edge when conventional outlets fail her. Fittingly, AMP’s atmospheric design heightens this tension. Stacey Boggs’ strobe lighting dazzles and menaces like an electrical storm, while her shadowy landscapes and yellow-green washes evoke mystery and disease. Shot on location in abandoned state wards, the show’s film sequences give Anna’s story an eerie calm; as she coolly wanders the asylum grounds, it’s unclear whether she’s found peace or has been anaesthetized into submission. Surrounded by disturbing medical props, Mary seems comparably rooted in her surroundings, nonchalantly sipping from formaldehyde jars or draping herself in plastic corpse sheeting. Videos of animal dissections, from laboratory frogs to the gutting of a fish, inspire similar grisly fascination, but might deter the squeamish. Combined, these elements draw striking parallels between ambition, brilliance, and madness, highlighting the thrill of discovery but also the danger in playing god or dwelling too long in realms of the mind. As Mary notes, the words “monster” and “demonstrate” share the same roots, and it is in this paradox that AMP lives, hovering between shock and elucidation, terror and wonder, and life and death. Where, it asks, do we draw the line between such extremes, and when does this line blur? Is that which we deem monstrous a perversion of nature or a natural response to a damaged world? And, most pointedly, by whose criteria do we judge exceptionality or freakishness? Like any good work of art or research, AMP sparks deeper inquiry and holds space for multiple interpretations. If, it posits, we challenge our definitions of good and evil, we may find reverence for the power and potential we share. AMP is written and performed by Jody Christopherson. Directed by Isaac James Byrne. Presented by Goode Productions. Sound and Projection Design by Martha Goode. Lighting Design by Stacey Boggs. Dialect Coaching by Chloe Dirksen. Films created by the company; Camera Ops/ Film AD's are Michael Niederman and Erica Phoebus. Photography by Jody Christopherson. Production Stage Manager is by Amy Marin. The cast is Jody Christopherson, with voice overs by Finn Kilgore, Ryan McCurdy, Jonathan West, Chloe Dirksen, and J. Stephen Brantley.